Chicken & Bacon Meatballs - Bacon and chicken! Whats not to love!! There are two foods that I can never say withoiut extreme excitement…two foods that I would choose to take to the moon or a deserted island (if I could only choose 5) to eat for the rest of my life! They are BACON!! & SHRIMP!! This post includes the first one…BACON!! I adore making meatballs for a couple of reasons; they are easy, economical, fun and the variations are endless! Plus you ALWAYS get a couple of meals out of them! I started playing around with ground chicken as a base for meatballs a few years back and I really enjoy them! My daughter doesn’t eat any form of red meat or pork (allergy). She wants to…boy does she want to BUT this is the hand she is dealt for now so we work around it. I have decided that, for me, the perfect way to make chicken meatballs is a combination of both white and dark meat. I use 50% dark meat to the white meat, so for a white meat lover like me…I still fell like that is what I am eating, however the dark meat portion lends extra juiciness to my balls…my ballz..my meatballs….no matter how I type that it makes me giggle! The addition of bacon (BACON!!) gives these chicken meatballs added flavor! These babies (can’t say balls again) are delicious on their own and even better as a sandwich! I serve these in a simple tomato sauce that my 10 year old daughter is usually in charge of making…she does the sauce, I do the balls OR she does both. Meatball & sauce making is one of our favorite things to do in the kitchen together, here is how she makes it…you should hear our half Italian half New Yorker accents…when we “maa-ka da bawwwlllzzz annna maa-kka da sawse” its quite the show, or so my husband says lol! What is your favorite meatball?? I am always on the hunt for a new type to try! I have a number of varieties Pinned on a my Meatballs! Pinterest Board – Check them out! So much goodness going on there!! OH and pop back on Monday when I will share my best (BACON!!) secret with you! You want to know this one!! Plus…Another awesome giveaway that I think you will enjoy! See you Monday! Cook your bacon pieces in a pan for a few minutes, add in the bacon and the garlic and saute until the bacon begins to crisp, remove bacon, onion and garlic with a slotted spoon and place them in a work bowl. Add in your ground chicken and work it through, add in your egg, milk, salt, pepper herbs and breadcrumbs and gently mix until it comes together. Form into balls and place on your lightly greased baking sheet (grease sheet with some of the bacon fat left over from cooking your bacon pieces) and bake meatballs for 20 minutes at 350 degrees. 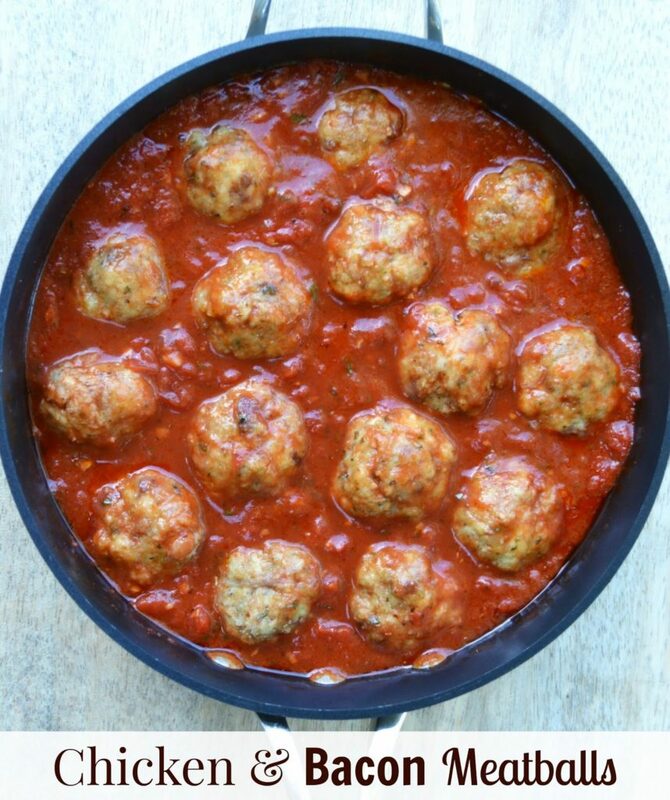 Place meatballs in a pot of your favorite tomato sauce, simmer for 15 minutes on low and serve. OR serve without sauce, your call. I just realized i have never shared my daughter Samantha’s 10 minute pasta sauce, I can’t believe that, lol! Just added that to my to-do-blog-list! Colleen’s Notes: Depending on the type of bacon you use for this, it will lend more or less saltiness to your meatballs, so remember that when seasoning. For herbs, you can choose to use fresh (1 TBS each of Basil, Oregano & Parsley), dried (less than half of that or one of the things ALWAYS in our fridge Gourmet Garden Italian Herbs (2 TBS). Mmmm, you got me thinking—-What would be the two things I would have to have on that desert island? I love both the items you chose, but they wouldn't be the two I would have to have. I will have to think about that. I am a meatball nut, however. Wonderful version of a meatball. My daughter in law has the same allergy! now I am craving meatballs! Oh yeah. This is just my kind of recipe! I'd eat this in a sandwich, over pasta, heck even over mashed potatoes! Yum. I love bacon too and love that you added them into these meatballs! Winning! Oh my goodness. Those meatballs. That photo. Mmmm I would probably use all dark meat in this recipe. 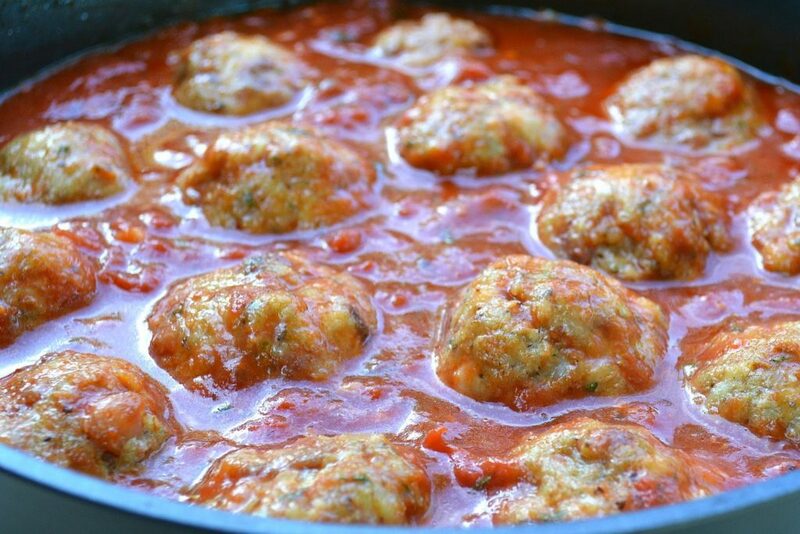 These meatballs look amazing!! I LOOOOOVE meatballs! I'm always looking for variations on the regular italian recipes and this looks just incredible. Loving all the meatball recipes I'm seeing today! You had me at "bacon" with these – brilliant! Bacon in meatballs? Brilliant. Never though to do that. I'll give it a try. Yep. Bacon makes the meatball! Hello there little happy meatballs! I used mild Italian ground chicken sausage (removed casings) mixed with a pound of ground turkey. Then your recipe the rest the way. My husband almost fell down in the kitchen after trying one. He stole the recipe and is presenting them at my mom’s easter dinner today. He’s so excited! Thank you for the inspiration. I couldn’t find the red sauce recipe so we are just bringing naked Ballzz. Lol! love that!! Hope your hubby wasn’t hurt in the almost-fall! I could have sworn I posted our homemade sauce (my daughter makes it for us since she was about 7) I will have to fix that!